So, ladies. You know that kind of day where you forgot your camera charger at the wedding you went to the night before? That, my friends, is the definition of a fail, and that is also why you are getting this wonderful nail tutorial in small instagram pictures. I apologize for the lack of large, detailed, edited photos. This was going to be a special one too because it isn't often that my nails come out good. I'd say 1 out of 7 of my manicures comes out the way I want it to. What can I say? You can't have it all. Well, please try to appreciate this anyway, OK? I almost shed a tear when I realized my camera charger was not with me. Please cross your fingers that the venue has it for me, k? 1. Get a Julep Maven box here and use code COLOR2012 to get it for one cent! (This step is obviously essential because their nail polish is awesome). I know every nail polish claims not to chip, but this one is for reals. 3. 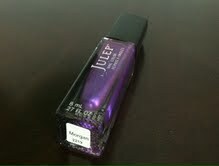 Paint your nails in your awesome Julep color (fine...I guess you can use a non-Julep one too). I used Morgan. 4. Do a second coat. 6. While your nails are still wet, sprinkle the glitter at the base of your nail, and if you're anything like me, you won't be perfect at it and you'll automatically get that little splatter going toward the middle/tips of your nails. 7. Apply a thick, glossy top coat. You're done! Congrats, your nails are officially gorg (and a tad bling-y). Go celebrate with a glass of wine. And also, don't forget about that finger crossing for my camera charger. I know these small pictures are pretty much ghastly. Love glitter accents on nails! I found you via wifessionals's blog!I'm your newest follower. If u wanna let me know. I am your newest follower, if you like my blog feel free to follow me as well :). I also have new section on my blog,check it out. gorgeous!! would be able to show them off while holding that glass of wine!!! Your right, those are awesome nails. Well done!! I am terrible at painting my nails!